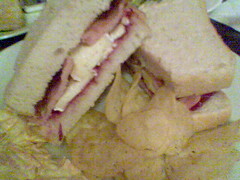 Bacon, brie and cranberry sandwich, on white doorstop bread with crisps and coleslaw. I have to admit, I wasn’t too sure about the BBC combination at first glance. I tend to not be too much of a fan of sweet relishes (the one example being Mrs Balls Chutney, a South African institution), but the flavours actually worked really well together. The fact that the bread was soft and fresh, the brie nicely creamy and gooey and the bacon well done all helped as well of course! This entry was posted on Sunday, December 4th, 2005 at 12:04 am	and is filed under Lunch. You can follow any responses to this entry through the RSS 2.0 feed. You can leave a response, or trackback from your own site.